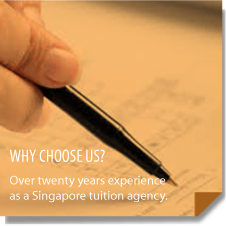 Established in 1985 as a pioneering tuition agency in Singapore. What started from a mum’s quest in search of the best tutor for her son, has evolved into a home tuition agency with a personal mission to help other parents with similar tuition woes, and in the process becoming one of Singapore’s most reliable tuition agencies. A tuition agency formed by parents for parents, with the aim of providing the best home tuition resource for students to realize their true academic potential. Our Aim is to offer personalized home tuition that targets student’s needs to bring out the best in each and every student. Customizing the tuition around the needs, interests and aptitudes of a child; shaping the way different child learn; to nurture the unique potential of every student. Unlike many other profit driven tuition agencies that have sprouted in the last few years, Edwin Tuition has nurtured thousands of students in the last 28 years through proper matching of tutors to students. In fact, many of our students have returned to join us as tutors upon their graduation, adopting the very same values that are passed to them. To bring out the best in each and every student.